Meet at top small gate MCP off Fairbairn st path from 9am to 11.30. Weeds are in seed but can still be removed to prevent infestations next year! We will be working to keep good areas good or freeing up special plants. Should be a lovely spring day in the bushland. The hop bush (Dodonea hackettiana) is looking stunning as the seed pods go redder, the rainbow bee eaters have been spotted and the mignonette orchids and Boronia alata are flowering. There has been some good germination this season in the bushland especially in the shady weed free areas on the eastern end of the fenced area. ToMP supported MP primary school and FoMPB to make 5 bat boxes with local champion Joe Tonga last Friday. Microbats were detected during the evening of the 2011 fauna survey at the cooling ponds. These bats favourite food are mosquitoes, hence located at the cooling ponds. 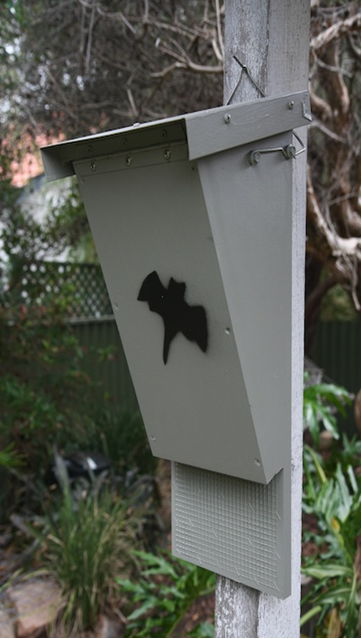 The bats may be living at Point Walter but now we can provide a home for them in MP. Owls and Tawny frog mouths prey on these tiny bats, so the more bats we have, the less mosquitoes and the more owls and tawny frog mouths. Now we know why a tawny frogmouth lives at the cooling ponds. Sunday, bring a water bottle, sun protection, long pants and closed shoes advisable. This walk is being organised by the Friends of Shenton Bushland Inc in conjunction with the Friends of Mosman Park Bushland.We have invited a number of guest presenters to interpret the route along the way. This walk is being organised to celebrate the completion of the Wardun Beelier Bidi stage of the Whadjuk Trails Network that the Friends of Shenton Bushland initiated over 10 years ago as part of the campaign to save the Underwood Avenue Bushland. For each year since then the Friends of Shenton Bushland have collaborated with other friends groups to organise a walk through remnant bush lands and coastal areas in Perth's western suburbs. The walk is planned to begin at 10am on Sunday 12th October at the North Fremantle Train Station. The walk is 14km long, with a stop for a picnic lunch break at at Chidley Point and ends at Cottesloe Train Station early in the afternoon. Details of the walk are still being arranged with the Friends of Mosman Park Bushland so these details may change. Anyone who registers will be notified of any changes. Participants are welcome to walk the entire trail or sections that suit their interests. See 2014 Map and link for registration! We’ll stop for a picnic lunch, pack plenty of food and water for the walk! We’d love some help this Sunday in Minim Cove Park from 9am to 11am! As you may be aware, there has been some mature tuart tree clearing in Mosman Park, on McCabe street, to make way for houses! Yes, this valuable asset the government is realising has been cleared to the minimum of 10% retention. Although a very sad time for residents of Mosman Park, our Natural Resources Manager, Heidi Khojasteh, has made sure the logs can be used around our town. Mark (husband) has been working on trying to stop the water erosion through the bushland along the path from the MCP BBQ. Last month’s Sunday busy bee, Heidi joined us and offered branches and logs from the felling to help with the erosion problem until we can get some plants established. So this Sunday, Mark, especially is looking for some help placing the logs. If there are any spare bodies on Sunday, I’d love some help to weed Gnarangup beach before the “Bush to Beach Walk”. Remember last year, Greg Keighery, a botanist with DEC, who had done previous surveys of MP’s flora came to visit us to clarify some plants for us. He left us his list of plants surveyed in th 1980’s. Native spinach was listed as a species at Gnarangup beach! Sure enough, there were 3 plants! Only one was in a sheltered position to thrive. I collected seed through out the summer and in May a couple of us direct seeded them. After an initial herbicide spray killing all the young provenance recruitments of native spinach, our seeds came up and are looking fabulous. Help me grow them up by hand weeding this Sunday! The natty thing about the native spinach is the associated moth which hardly damages the plant but keeps the local small birds fed! Soon when we have spare seeds you can all grow it in your own back yards as a source of food for you and wildlife! Forecast is for rain on Sunday! Can we be that lucky? May need a raincoat! Otherwise same as usual, protective shoes, hat and water bottle! Morning tea at 11am when we finish! Meet at the small gate into the bushland at the end of the Fairbairn street pathway. How is Buckland Hill fairing two years after being burnt? Too frequent fires in Buckland Hill's natural area has resulted in a loss of biodiversity of flora and fauna and an increase in fuel load (weeds). Heidi Khojestah (ToMP bushcare officer) has left this area for volunteers to weed as it has quite a good variety of species that may get killed by off target herbicide spraying. In this area is one Jacksonia (I do not know of any others in MP), Scaevola nivea, autumn lilly, (Tricoryne elatior), parrot bush, (Banksia sessilis), native grass, (Austrostipa elegantissma), ground cover banksia, (Banksia dallaneyii), Coastal honeymyrtle, (Melaleuca systena), Chenille honeymyrtle, ( Melaleuca hueglii) and of course the beautiful red cockies tongue (Templetonia retusa). The burnt dead shrubs, although added fuel load, reduce windspeed, provide dappled shade for emerging plants and are a place for birds to perch. By the time the plants have grown up, these dead shrubs will have broken up. A build up of organic matter over the years in sheltered positions has meant we have pink fairy orchids once again in Buckland Hill. Lets make this area a beautiful place once again to walk and admire the view to Rottnest Island. Sun out, the help poured in from Scotch college! The rain waited for nightfall! What a great way to plant! In one and a half hours, locals with 50 Scotch students and parents planted 750 local plants! This adds to the work already started 5 years ago! All help was gratefully received! Preschooler, Natalie Collier and her sister, Clara were eager to join the planting team once again! The photo shows the remnant Grevillea thelmanianna patches where a diversity of plants were planted around them to provide a diversity of habitat for our wildlife and increase the link from one lot of bushland to another. Someone’s jumper thrown over the location sign aptly made the area Minim Cove ark. Quite fitting as this bushland just happens to be home to plants not found for some distance. In the Minim Cove ark we have one remnant huge quandong plant, 4 native spinach plants (Tetragonia tetragonoides), 6 native celery plants, a couple of native apricots (Pittosporum ligustrifolium) and a couple of Cyclops wattle, who’s seeds are edible. This makes for quite a feast. If we keep planting here the river could be so healthy, there might be a fish to go with the above. Community Planting Day this Sunday 8th June 2014 in Mosman Park!